Amsterdam, NL – Stroke remains a leading cause of adult disability, and the global burden of stroke continues to grow with devastating consequences for patients, families, and caregivers. In this special issue of NeuroRehabilitation leading international experts on stroke rehabilitation provide theoretical and practical insights into the steps necessary to push beyond merely compensatory training and onto a level of recovery that is satisfactory for patients. 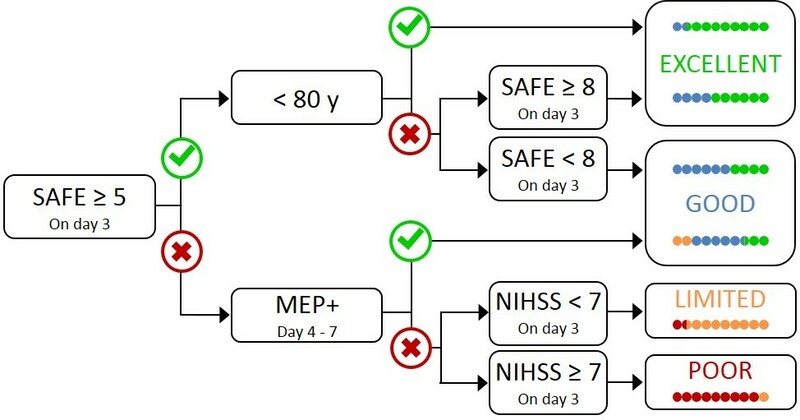 Caption: The PREP2 algorithm predicts upper limb functional outcome at three months post-stroke. The four possible upper limb outcomes are color-coded. 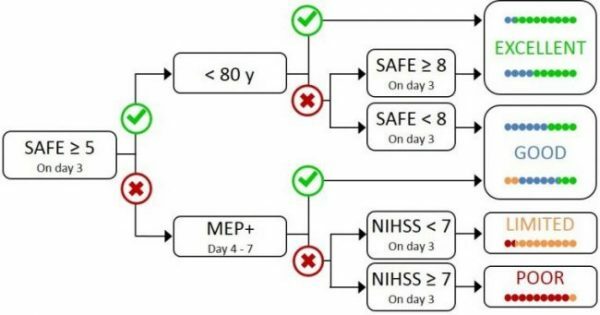 The colored dots depict the proportion of patients expected to achieve each color-coded outcome, depending on their pathway through the algorithm, based on the results of a CART analysis. 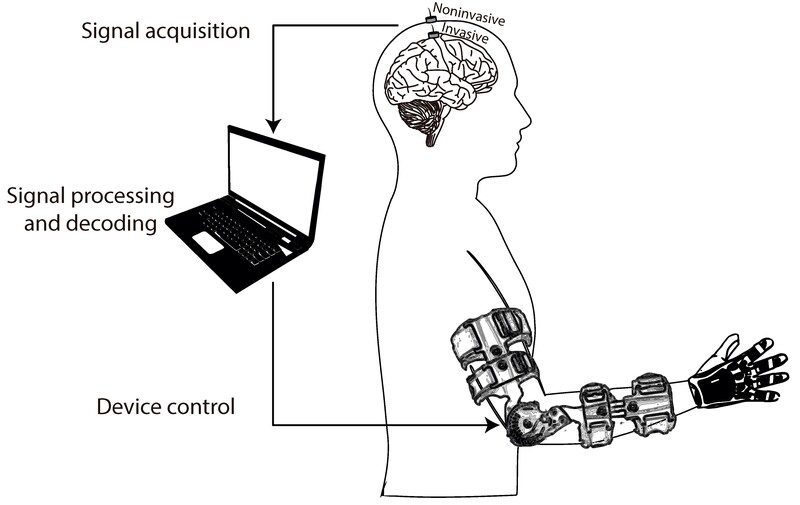 Caption: General diagram of a brain-machine interface for upper-limb motor rehabilitation. During the BMI therapy, the patient with upper-limb paralysis would be asked to imagine/attempt to move his/her paralyzed arm, and those intentions would be translated into the actual movement of the patient’s limb. The activity from the brain is recorded with noninvasive or invasive electrodes. Then, it is processed in a computer that extracts relevant features and decodes information from the imagined/attempted motor task, based on a calibration procedure performed with previously-recorded examples of movement imaginations/attempts. The information decoded from the brain activity is translated into control commands for the robotic or prosthetic device, which mobilizes the paralyzed limb of the patient, exciting his/her afferent pathways. Contact Diana Murray, IOS Press (+1 718-640-5678 or d.murray@iospress.com) to obtain full text of the articles listed or go directly to the links below. Journalists wishing to request interviews with the guest editor or authors should contact Richard Harvey, MD (rharvey@sralab.org).